Capital senior David Ainuu was a first-team all-league selection at defensive end last season for the Cougars. He is also an All-American in rugby. Photo credit: Grant Clark. It was a sink or swim scenario for David Ainuu. During his freshman year at Capital High School, Ainuu, admittedly, may have had a little too much fun, neglecting his studies along the way. This did not sit well with his parents who tackled the problem head-on and enrolled their son in Running Start, a program giving students the opportunity to take college courses while attending high school. Ainuu was either going to crack down on the books in a much more difficult environment or drown in the process. Turns out the kid can swim with the best of them. Ainuu is now a dual threat – equally successful in the classroom and on the field – and while he makes everything look effortless on the gridiron when he plays, the road to get to this point was a challenge. 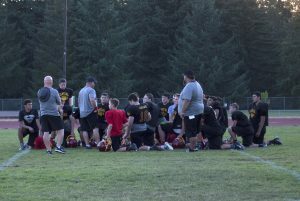 A first-team all-league selection at defensive end last year, Ainuu will be a one of the 3A South Sound Conference’s top two-way lineman this season for the Cougars. With his long, thick dark hair sneaking out of the back of his helmet, Ainuu, at 6-foot, 265 pounds, is easy to spot on the field and while he excels in football, he knows his future lies elsewhere. 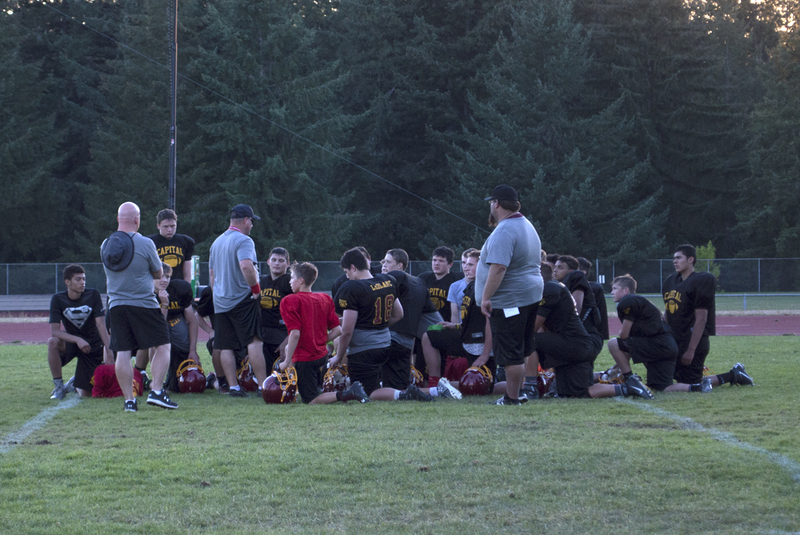 Capital High School football coach John Johnson, who enters his 10th season with the Cougars, addresses his team following a practice. Photo credit: Grant Clark. Ainuu is also a standout rugby player who has several collegiate programs clamoring for his attention with Army West Point establishing itself as the current leader. 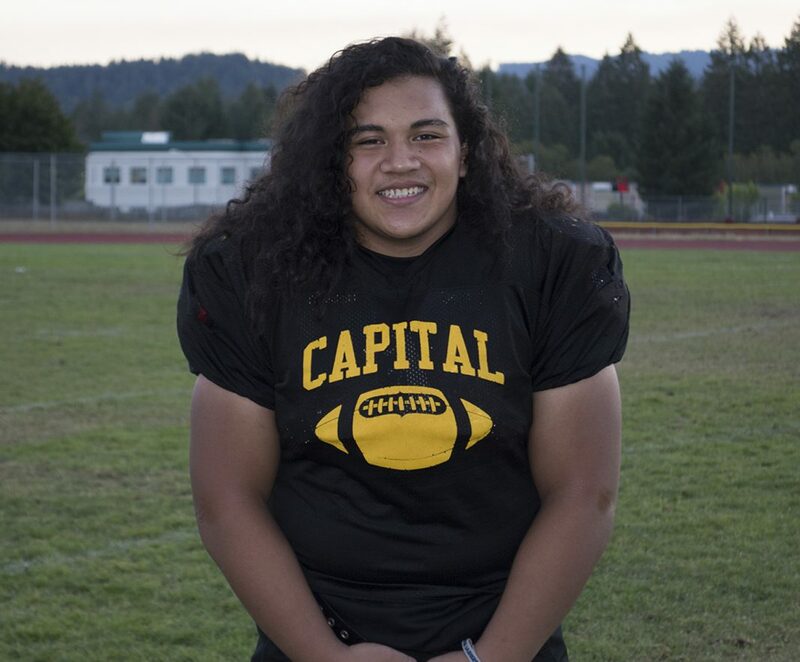 But that’s not to say Ainuu won’t wreck any less hectic in the trenches while giving everything he has to the Cougars football program this season. It was Ainuu’s actual brother, Dylan, who first introduced his younger sibling to the world of rugby – albeit reluctantly. 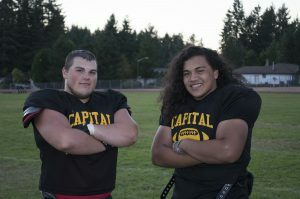 Brad Clark (left) and David Ainuu will start this season at the offensive guard positions for the Cougars football team. Photo credit: Grant Clark. Ainuu, who plays rugby for Renton’s Liberty Patriots club, quickly excelled at the sport and by his sophomore year was playing for the USA High School All-American under-17 squad. It was through his play with the All-American team that Ainuu captured the interest of Army West Point rugby coach Matt Sherman, who coached the squad during their 2015 trip to France. No matter where he ends up playing rugby in the future, Johnson knows Ainuu’s background in the sport will benefit his Cougars greatly this year.